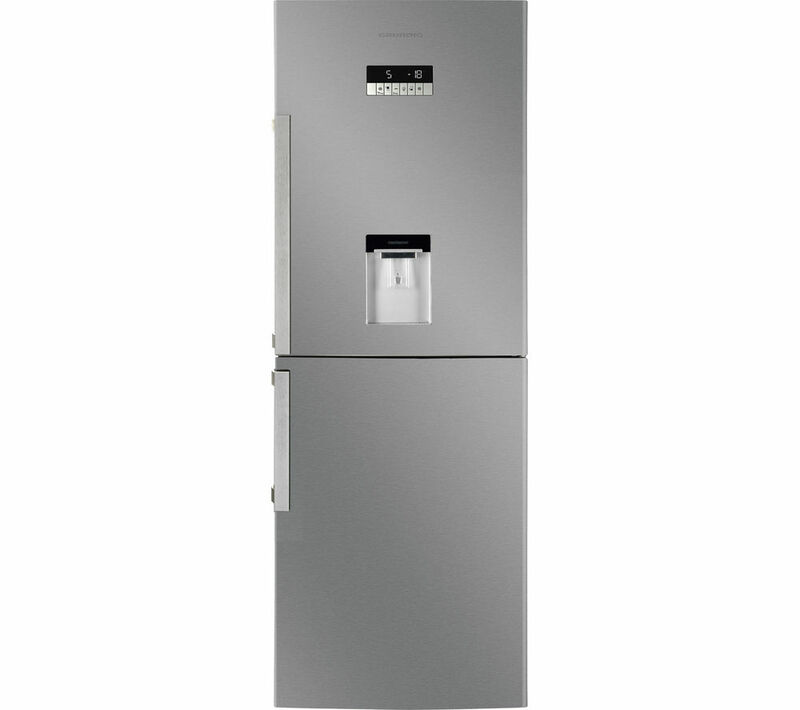 Overview & specs of Grundig GKN16910DX Fridge Freezer Stainless Steel by Currys PC World. Top features: - Quick Cool and Fast Freeze help to quickly reduce temperatures to preserve food for longer - Frost free design helps to save you time and energy in the kitchen - Water dispenser offers convenience without the need for plumbing - Digital display makes it easy to monitor and adjust the settings Quick Cool and Fast Freeze The GKN16910X helps to preserve your food for longer with Quick Cool and Fast Freeze. Quick Cool rapidly lowers the temperature of the fridge, while Fast Freeze performs the same in the freezer. These functions combine to ensure food keeps its nutritional value and flavours, ideal for new shopping. Duo Cooling separates the cooling systems for the fridge and freezer, helping to eliminate odour transfers and preventing food from drying out. Bacteria in the fridge is kept at bay by IonFresh technology, which keeps the air inside clean and neutralises harmful bacteria. The appliance maintains a fresh smell thanks to its carbon odour filter, which helps to eliminate unwanted and unpleasant smells. Frost free Maintaining the GKN16910 is easy thanks to its frost free design. This ensures that there is no ice build-up in the freezer, saving you time and energy. It helps to preserve the available space and prevents food items from sticking together. Water dispenser Enjoy chilled water at your convenience with the built-in water dispenser. There's no plumbing required as it uses an internal water tank. Digital display Touch controls and an LED display make it easy to monitor the performance of the GKN16910, as well as allowing you to make adjustments to the temperature. With a large net capacity of 313 litres, it is easy to store all of your shopping. Plus, with a five year parts and labour warranty, you can be confident that the appliance will last for years to come. ___________________________________________________________________________ PLEASE NOTE: Use in outbuildings: This refrigerator is not designed to be used in an outbuilding - both your food and the appliance can be damaged. Do not use it in any unheated area. Reversible door hinges: This appliance has a reversible door. Please consult our Knowhow team or a qualified installation expert to carry out door reversal - select the door reversal service when you add this product to the basket. We are comparing prices for Grundig GKN16910DX Fridge Freezer Stainless Steel in new condition sold by Currys Pc World.